Written by Mike C. Fletcher on Jan. 21, 2005 in Vindaloo. Last update on Jan. 21, 2005 . This is actually a picture from after having my meeting with Stephen earlier in the week. 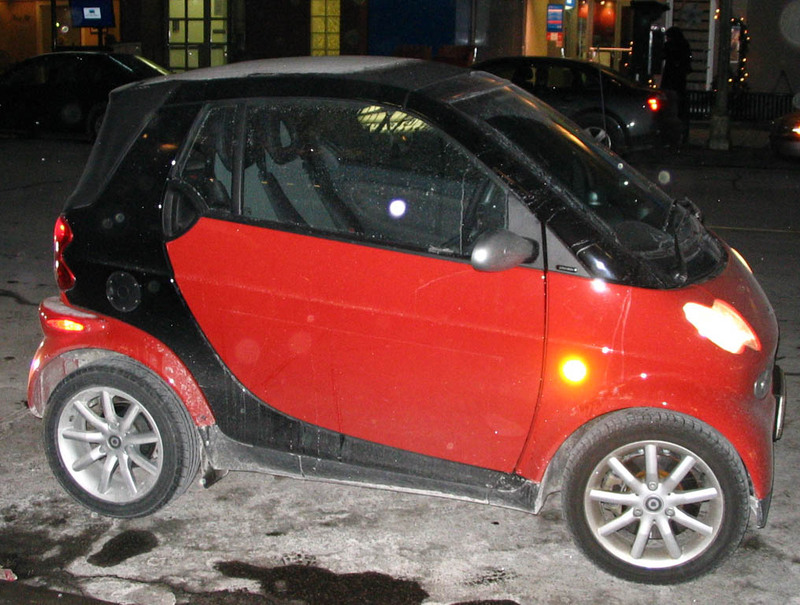 This is a Smart car, which you can see in Toronto these days. It's a tiny 2-seater commuter car. 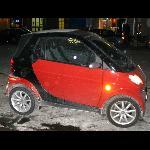 I'm very seriously considering getting one should I wind up needing a car anytime soon. 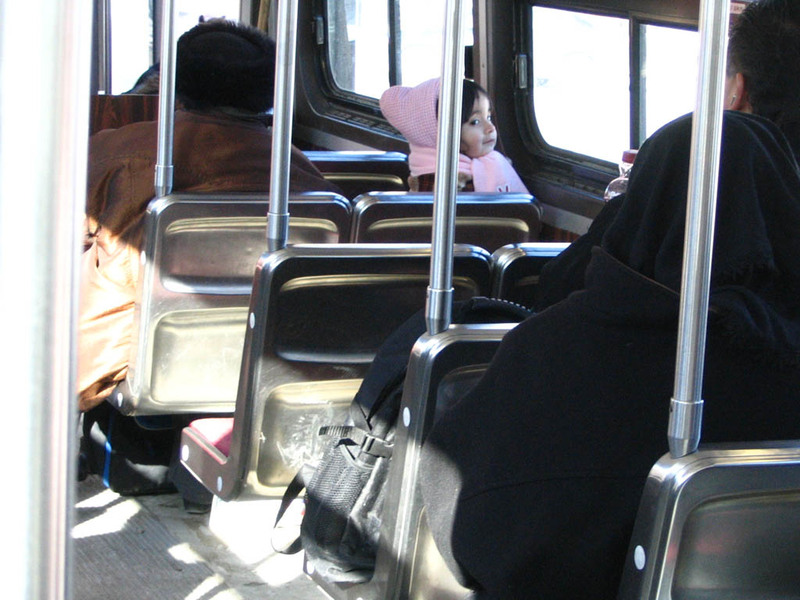 "Why would anyone really need a car in Toronto? ", I'm sure you're asking. Don't worry, I'm not planning on buying one any time soon, it's just a back-of-the-mind in-case-some-day-I-ever-do-need-to nice-to-know-what-I-want kind of thing. This lil' cutie kept looking at me out of the corner of her eye. Her momma was in such a huge coat that the two of them looked like a big and little plush set. They were with me the entire trip home, so I got quite a few shots of them. 3 turned out okay of the 15 or so that I shot. I really wanted to get a picture at the bus-stop waiting for the streetcar, but some cell-phone user wandered right into the shot. And finally, this man on the bus with a fascinating face. 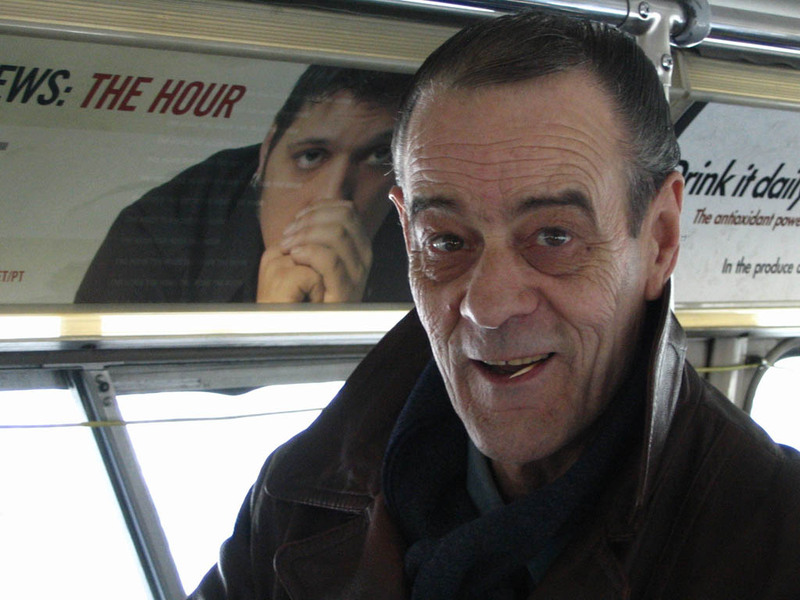 He was friendly and amiable, chatting about cameras and such for the 3 or 4 minutes we were on the bus together. He seemed quite taken with the idea of disposables, while I felt it necessary to enthuse about the wonders of digital, where I can take 100 or 200 shots in a day without needing to worry about the cost. It really does let you take far more low-chance-of-success shots on the off chance that something will turn out, instead of wasting lots of time trying to line up that one perfect shot on which to spend the film. I actually think that shot is the best I've taken so far with this camera, though probably all of that is the subject matter. Just a fascinating face, deep, cheerful, and relaxed with the "I'm trying to be important" face of the young newscaster in the background.